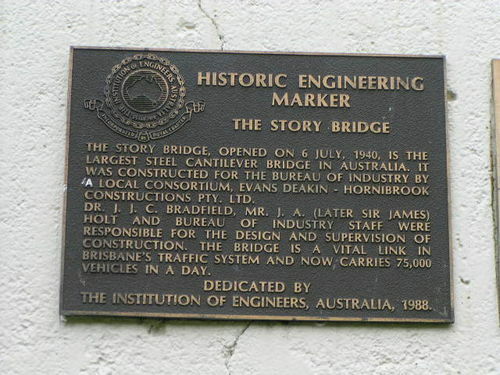 An Historic Engineering plaque commemorates the construction of the Story Bridge. A second plaque, unveiled on the 15th June 1999, commemorates the ownership of the Story Bridge by the Brisbane City Council and the people of Brisbane. The Story Bridge, opened on 6 July, 1940 is the largest steel cantilever bridge in Australia. It was constructed for the Bureau of Industry by a local consortium, Evans Deakin - Hornibrook Constructions Pty. Ltd. Dr J.J.C. Bradfield, Mr J.A. (later Sir James) Holt and the Bureau of Industry staff were responsible for the design and supervision of construction. The bridge is a vital link in Brisbane`s traffic system and now carries 75,000 vehicles in a day. THE INSTITUTION OF ENGINEERS, AUSTRALIA, 1988.